The international media covered the fall of Barcelona and that of the whole of Catalonia in 1939. Almost 250 journalists and press photographers were accredited by the French authorities before they were sent to the border of Catalonia to inform, with his articles and photographs, of the humanitarian drama that represented the Civil and military withdrawal of Spanish and Catalan Republicans. The important production of local or international photographic agencies represents a visual heritage of the first order. All these images have become the essential pieces of the graphic memory of this tragic event over the decades. However, this visual corpus, conditioned by the immediacy of its dissemination, due to its various file policies, has not been the object of real scientific work. 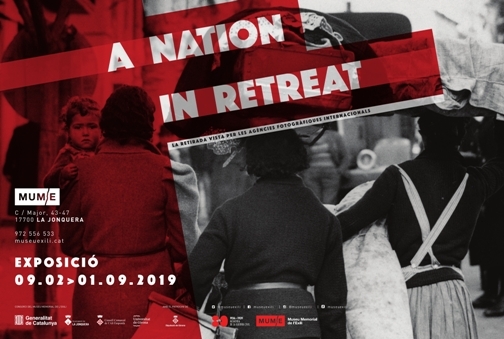 The exhibition A nation in retirement intends to display, from more than 80 photographs, a reading, day by day, of Retirada. A selection of the images sent by international agencies is presented between January 26 and February 10, 1939.